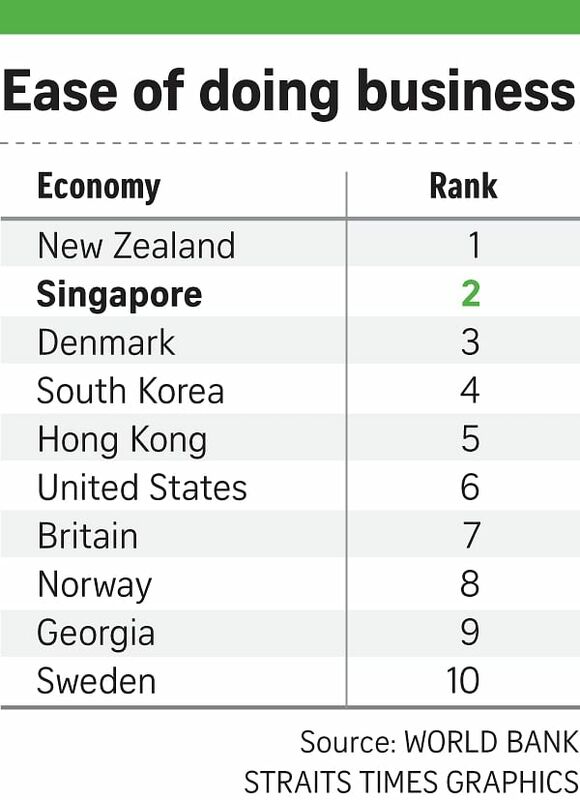 Singapore has been ranked second in the world for ease of doing business for the second year running, according to a World Bank report out yesterday. The Republic came in behind New Zealand for the second consecutive year, following years of topping the rankings. The annual report, now in its 15th iteration, tracks 190 economies' efforts to encourage investment and job creation by cutting red tape and reforming regulations. The report uses metrics like starting a business, dealing with construction permits, getting electricity, registering property, getting credit and protecting minority investors, among others. It found that starting a business in Singapore takes just 21/2 days - putting it at sixth place globally - compared with a whopping 230 days in Venezuela, which ranked last on this particular measure. The Republic also ranked among the top 10 in the world for protecting minority investors, ease of paying taxes and enforcing contracts. However, it fared less well on measures such as ease of obtaining credit and resolving insolvency. Countries with higher scores also tend to create more jobs, according to the report, but it warned this correlation should not be interpreted as a cause. Countries with lower scores also tended to exhibit higher income inequality, it said. The World Bank report also said Sub-Saharan Africa was again the region which saw the most progress - but countries there varied widely in performance. The report also found that developing economies such as Nigeria, India, Thailand and El Salvador have made the largest strides in improving their business climates. "It is particularly gratifying to see that many of the reforms are being carried out in economies and sectors where they are most needed," Ms Rita Ramalho, acting head of the bank's Global Indicators Group, said in a statement reported by Agence France-Presse.